Willis Joseph Bray(1884-1961) was Professor of Chemistry at Northeast Missouri State Teachers College (now Truman State University) from 1912 until 1952. 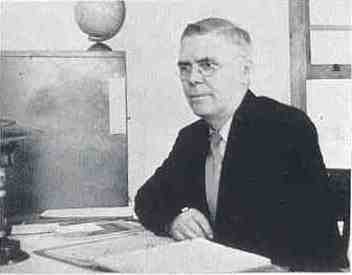 He joined the faculty as Head of the Chemistry Department when Northeast was still the First District Normal Schooland was named Head of the Division of Science and Mathematics in 1925. While teaching at the college, he also served several terms as Chemist and Bacteriologist for the City of Kirksville. He stepped down as Division Head for health reasons in 1945 but continued teaching until June 1952. A 1st Lieutenant in the US Army Ordnance Reserve Corps, Bray was called to active duty in Washington, DC during World War I. He returned to the Reserves after the war, transferred from the Infantry to Chemical Warfare Service in 1926, and had risen in rank to Major when recalled to active duty in 1942. A heart problem necessitated his medical retirement in March 1944. Dr Bray was very active in the Masonic Orders and attained the offices of Grand High Priest of the Royal Arch Masons, 1934, and Grand Master of the Grand Lodge of Missouri, 1945-46. He edited several editions of the Transactions of the Missouri Lodge of Research and authored many Masonic articles and booklets. This collection of 60 articles, addresses and essays, a gift of his son, Willis J Bray, Jr, contains a mix of rough drafts, more finished typescripts and published versions (mostly photocopies) of Dr Bray’s works. ▪ Ryle, Walter H. "Willis Joseph Bray". Address delivered at the unveiling of the portrait of Willis J. Bray, Grand Master, Grand Lodge of Missouri, Kirksville Masonic Temple, April 1, 1945. ▪ “Achievement in General Chemistry as it is Related to Certain Learning Abilities”. Bulletin of the Northeast Missouri state Teachers College 31:6 (1931). ▪ “The Intangible Values of College Life”. Address before the Freshman Class, Sept 7, 1948. Bulletin of the Northeast Missouri State Teachers College 48:10 (October 1948). ▪ “Education for Happiness”, High School Commencement Address, Kirksville, Bethany, Lewistown and Hurdland, MO , May 1935. ▪ “Kiwanis Education and the Under-privileged Child”. Delivered at a joint meeting of the Kirksville and Moberly, MO clubs, Mar 23, and at the Mo-Kan-Ark District Spring Conference, April 6, . ▪ “The Nomenclature of Biology Courses in Teachers Colleges”. Science Education 17:3 (Oct 1933). ▪ “The School’s Responsibility for Physical Efficiency” The Rural School Messenger 5:3-4 (Nov-Dec 1915). ▪ “Science in General Education”. Science Education 23:2 (Feb 1939). ▪ "The Selection of High School Science Textbooks”. Science Education 18:3 (Oct 1934). ▪ "A Study of the First Class High Schools of Missouri”. Normal School Index, Feb 5, 1915. ▪ A Study of the Graduates of This Teachers College by Major Fields for the Years 1931 to 1933 inclusive.